In volume and revenue terms, the Northeast Corridor (NEC) must be the most important passenger rail market on the American continent. The term ‘Northeast Corridor’ tends to be used to refer to one railroad, the 736 km mixed-traffic line linking Boston, New York, Philadelphia, and Washington DC. However, Amtrak, the nationalised operator of long distance passenger rail, has long-term ambitions to build a 705 km dedicated high speed line serving the cities of Northeast megalopolis (‘NextGenHSR’). Amtrak is also planning to continue upgrading the existing railroad and trains (‘NEC-UP’), although this is complicated by the fact that ownership of infrastructure varies from one part of the line to the next. Earlier this month (July 2012) Amtrak updated its Vision for train service in the Corridor, which is now costed at $150.5 billion. On the face of it there seems to be a much better case for very high speed rail in the Northeast Corridor, than there is for HS2 in Great Britain. Average express speeds on the NEC are much lower than on the West Coast Main Line, and Amtrak are only able to run one Acela high speed train per hour in each direction. However, an article by Matthew Yglesias on Slate presented a different angle on the Amtrak vision. […] at today’s ultra-low interest rates it would genuinely be quite affordable to take out a 30-year loan and start building. On the other hand, as an actual proposal for what to do with $151 billion in transportation money, this is borderline insane, mostly serving to solve a not-particularly-severe problem at exorbitant cost. I strongly recommend this Alon Levy post about a set of drastically cheaper smaller-scale interventions that could get travel time from Boston to Washington down to about four hours for about a tenth the cost of what Amtrak is proposing. One key virtue of that alternative is that it would be cheaper. Another even more important virtue of that alternative is that it might actually get done! Projects of the scale Levy is talking about would be expensive, but genuinely within the fiscal capacity of the local jurisdictions to undertake whether or not trains happen to be in vogue in Congress next year. But even if you spotted me the extra $135 billion to spend on transportation in the region, I still wouldn’t go for the Amtrak plan. Less-than-perfect intercity transportation connections are annoying when you experience them, but ultimately not the biggest deal in the world. Things that could transform people’s daily lives — incremental upgrades to commuter rail networks, an extra subway tunnel for the D.C. central business district, improved bus shelters and signage, removal of neighborhood-destroying freeway spurs — are much more important than shuffling people between big cities at best-in-the-world speed. Meanwhile, dreaming of the super-expensive plan is distracting Amtrak from actually investing time in scrounging up the money and interagency cooperation it would need to complete the almost-as-good upgrades Levy is talking about. HS2 provides a similar instance of ‘solving’ a not-particularly-severe problem, at exorbitant cost. The time saving offered by HS2 to London is 33 minutes per journey (more likely 20 minutes, when the position of Curzon Street is taken into account). According to Network Rail, in 2009-2010 2.32 million West Coast journeys were made between Birmingham and London by rail. Assuming all of those were made by residents of Birmingham, the usage works out at one round trip, per citizen, per year. On that analysis, HS2 would save the average Birmingham resident 40 to 60 minutes per year. But if it’s assumed that Londoners made half the journeys, the average Birmingham resident’s benefit would be around 20 to 30 minutes per year. If the evaluation is extended from Birmingham to the West Midlands county, the per-capita saving from HS2 falls below 10 minutes per year. Even with the Y network in place, the low per capita volume of rail travel to London would mean that annual time savings for residents of northern cities could not be significant. People make more short journeys than long ones, so there are greater benefits from an investment policy that improves connectivity within metropolitan areas (such as Birmingham Crossrail). Table 3 of HS2 Ltd’s January 2012 ‘Economic Case for HS2 Value for Money Statement’ listed benefit-cost ratios of “alternatives” to HS2. With this month’s government announcement on rail investment for Control Period 5, the case for HS2 has weakened further, as electrification of large parts of the Midland and Chiltern Main Lines means that the baseline for comparison has changed. While there are many alternatives to investing in very high speed rail, the £40 billion Y network is not an alternative to spending money on classic rail. Upon its completion, access to everywhere except London, Manchester, Birmingham, and Leeds, would still depend on the use of non-HS2 track. In April 2012, the government admitted that the official benefit-cost ratio (BCR) for HS2 phase one (London — West Midlands) had dropped to 1.2, putting it close to the “poor” value for money category. The Department for Transport’s method of BCR calculation has been widely criticised, particularly in respect of the valuation of in-vehicle time. However, there are other problems, including non-valuation of irresilience, construction disruption, and visual impact, and some non-government estimates put the true BCR for both phases at well below 1. On July 27, the Financial Times reported that HS2 Ltd’s chief executive claimed that cost-benefit methodology “isn’t really designed for the big, transformative projects”. “I think it is very misleading for people just to focus on London to West Midlands [phase one] because that’s not the proposition. The proposition is to go to Manchester and Leeds,” said Alison Munro, chief executive of HS2 Ltd, the government agency tasked with delivering the project. The HS2 proposition does involve ‘going to Birmingham, Manchester, and Leeds’. But it also involves ‘not going’ to Barnsley, Doncaster, central Sheffield, central Nottingham, Derby, Leicester, Coventry, the Black Country, Wakefield, Bradford, Rochdale, and Bolton. Because HS2 would not serve such places, there has to be continued investment in legacy main lines, to replace their assets as they wear out. Or as Andrew Adonis would call it, “patch and mend”. The high cost interventions proposed by Atkins on the Chiltern Main Line at Banbury are apparently not part of the Chiltern electric spine works. As well as including unnecessary civil engineering, Atkins’ Rail Package evaluations also conflated upgrade and asset renewal investment, producing figures of little decision-making value. Replacement of worn out classic rail assets in itself is not an ‘upgrade’. Only the cost of any net capability increase, not the gross investment, is relevant for BCR comparison against HS2. And wider economic impacts, avoidable costs, and disruption costs need to be assessed on an equal footing. So far, that has not happened, yet rail upgrades still wipe the floor with HS2. In fact, one of the first uses of cost benefit analysis (CBA) was the evaluation of a “big, transformative project” — London’s Victoria Line — against alternatives. Cost benefit analysis was intended to be used to provide a fair assessment of the benefits of alternative courses of action, not to construct a case for a preselected scheme. But as its name suggests, HS2 Ltd was set up with a particular agenda in mind. Ciudad Real Central Airport (IATA: CQM, ICAO: LERL), previously known as Don Quijote Airport and South Madrid Airport, is an airport south of Ciudad Real in Spain. Located adjacent to the A43 motorway and a short distance from the AP41 toll road, it was projected to have a connection to the Madrid –- Seville high-speed rail line, making it the first Spanish airport to be linked to the AVE system. Via AVE, the airport would have been 50 minutes from central Madrid, 50 minutes from Córdoba, and less than 2 hours from Seville and Málaga. It was the first international private airport in Spain, costing €1.1 bn to build. In April 2012, the airport was closed after just three years in operation, its management company having gone into receivership. It had not received scheduled flights since December 2011, when low-cost airline Vueling withdrew its last route. A BBC News magazine report suggests the airport was planned to fail by its investors, who benefited from construction contracts awarded to their own companies. BBC News reported yesterday’s Action for Rail protests against London Midland’s proposed closure of some rail ticket offices, which mostly concern stations in the West Midlands area. Protests have been held at four railway stations in the West Midlands over proposals to close ticket offices. Campaigners said they were angry at plans by London Midland that could see nine ticket offices closed and opening hours reduced at a further 77. London Midland said the number of tickets being bought at offices was in “steady decline”. Leaflets were handed out at stations in Birmingham, Stourbridge and Worcester. The Department for Transport (DfT) said it would be making a decision on the London Midland proposals soon. The TUC said Adderley Park, Bescot Stadium, Cheddington, Duddeston, Jewellery Quarter, Lye, Small Heath, Witton and Wythall stations would see closures under the plans. A spokesperson said: “Rail passengers are being hit by closures to ticket offices which will leave many stations deserted and devoid of staff. Whether passenger ‘help, reassurance and safety’ is maximised by having manned ticket offices at every station, is dubious. On 30 November 2009 the Daily Mail reported that two staff at Wadhurst, East Sussex, refused to help a lady carry her baby buggy up the station stairs, because they were “not insured”. A spokesman for Southeastern Trains said that the main factor in the staff’s refusal to help would have been if they thought it would affect the safe running of trains. The spokesman said there were no formal guidelines on whether staff should help lift a baby in a buggy. It’s unfathomable why there isn’t an intensive national programme to provide stations like Wadhurst with accessible ramps, CCTV, and real time information (that actually works). Unfortunately Southeastern’s spokesnumpty never got around to explaining whether or not staff were “insured”, or how staff lifting a baby buggy would affect the safe running of trains. Apart from its underground sections, the Tyne and Wear Metro operates with unstaffed stations. Its crime statistics do not support the notion that having manned ticket offices generally makes travel safer. According to the government’s Railways Act 2005 statement on investment for Control Period 5 (2014 – 2019), its strategy is built around four priorities. […][6.] The first of these [priorities] is the creation of the “Electric Spine”, a high capacity passenger and freight electric corridor running from the South Coast through Oxford, Bedford and via the Midland Main Line to the East Midlands and South Yorkshire, with a link from Oxford to the West Midlands and the North-West. The Electric Spine investment is expected to deliver cost savings to the railway in the medium term, because electric rolling stock has lower purchase, maintenance and fuel costs. It also leads to choices for further efficient route electrification in Control Period 6 (CP6). [7.] The creation of an electrified route linking the core centres of population and economic activity in the Midlands and North with the major container port of Southampton is a crucial step in creating the right conditions for significant private sector investment in electric freight locomotives, which offer more efficient, capable and sustainable freight haulage. The rolling programme of electrification is expected to help make rail freight commercially more attractive across England, supporting our growing international trade and the transfer of container traffic from road. [8.] The Government’s second strategic priority is to increase capacity and accelerate journey times between our key cities, investing in faster trains (Intercity Express Programme) and route improvements. Major new investment is focussed on the Great Western, East Coast and Midland Main Lines, complementing recent investment in routes such as the West Coast Main Line and trans-Pennine routes. [9.] The third strategic priority is to facilitate commuter travel into major urban areas, helping to expand the effective labour market, and helping people to access a wider range of jobs. A significant investment project is the electrification of the Welsh ‘Valleys’ lines. This is a transformational scheme supporting the long-term economic renewal of the Welsh economy. The HLOS sets out peak city demand to be met; designed to support economic growth in the North East, Yorkshire, North West, Midlands, West, and London and the South East. By boosting rail capacity and capability in west and south Yorkshire, enhancing North-Eastern connectivity and completing the Northern Hub, this investment is expected to unlock major economic benefits in the economies of the northern cities and conurbations. [10.] Our fourth strategic priority is to improve railway links to major ports and airports. The Government wishes to see a new railway link to give western rail access to Heathrow Airport. This will be subject to a satisfactory business case and the agreement of acceptable terms with the Heathrow aviation industry. It will provide a major boost to the airport’s accessibility, substantially reducing Heathrow airport journey times from Wales and western England, supporting the extension of the vibrant Thames Valley economy westwards, and complementing the proposed high speed rail access. Other airports will also benefit from enhanced rail links. Port links will be improved, notably from Southampton with the initiation of the ‘Electric Spine’ and from Felixstowe with the provision of capacity to cross increasingly busy routes radiating from London. 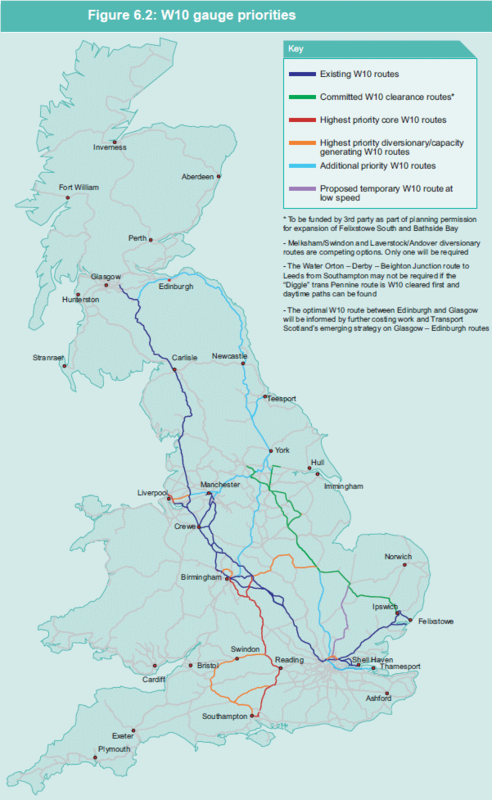 Currently roughly half of national railfreight involves the use of the W10-gauge and electrified West Coast Main Line ‘at some point’ of transit. However, only about 5% of goods traffic is electrically hauled, and shortage of work has led to electric locomotives being put into store, or sold to foreign operators. As can be seen from the map in Network Rail’s 2007 Freight Route Utilisation Strategy, the Midland Main Line was not listed as a priority for freight-oriented investment, so the new ‘electric spine’ suggests that strategy is in a state of difficult flux. In the post-war period, there have been many cases of public capital being wasted on poorly planned rail schemes, so it is important that future investment and utilisation strategy is planned carefully. The electric spine is largely dependent on continued intensive use of West Coast Main Line for North – South freight, as the northern limit of Midland Main Line electrification appears to be Sheffield Midland station. With such a configuration, it will be a challenge to realise the objectives of maximising freight by rail, or creating “the right conditions for significant private sector investment in electric locomotives”. HS2 Ltd technical director Prof Andrew McNaughton and Arup Global Rail Leader Colin Stewart were among those contributing to New London Architecture’s event ‘High Speed 2: Impact and opportunities for the capital’ (20 July 2012). The NLA website was updated with a summary of the proceedings, written by David Taylor (extracts below). McNaughton said that a two-station solution was required at the London end of the line at Old Oak Common and Euston, because without this, any speed advantages would be lost in congestion. ‘If anyone doesn’t understand that, try Shanghai’, he said. As part of the plans, Euston will be expanded with 10 new platforms, potentially underground in order to foster better pedestrian movement across the site. […]rather than talk of ‘mitigating’ the line, we should be maximising its positive elements, said Arup’s Global Rail Leader director Colin Stewart. ‘We’re looking for something for the next 50, 100, 200 years’, he said. ‘It’s legacy, so we have to get it right’. Arup was heavily involved with the Channel Tunnel Rail Link project, where they certainly didn’t “get it right”. HS1 runs well under passenger capacity, yet is too steep for efficient freight operation. Total losses to the public purse were recently estimated by the House of Commons Public Accounts Committee at £10.2 billion. Apart from St Pancras, most of HS1 architecture is mediocre or worse. And the Midland Main Line now has platforming constraints which never previously existed. With a two-level Euston “solution”, it’s likely that ten HS2 platforms could be provided without land take, but that ignores the actual raison de construire — which is property development, and sale of air rights. In transport terms, the HS2 station at Euston is not necessary, but that is true of HS2 itself. ‘Rail Package 6’: With a Chiltern Main Line station at Old Oak Common, interchange with Crossrail, Overground, and Underground could be established. Constructing a high speed railroad between Los Angeles and San Francisco would at best have a marginal impact on Californian economic growth. So reported the Los Angeles Times on July 13, in an article that recounted UCLA senior economist Jerry Nickelsburg‘s evaluation of growth rates of locales served by Japan’s Shinkansen. Construction of Japan’s vaunted bullet train began in the mid-1960s, and it did not generate higher economic growth or additional jobs, according to the study. Nickelsburg examined the growth rates of cities and regions served by Japan’s system, compared to the nation’s overall rate of growth, and found that the introduction of high-speed passenger service had no discernible effect. Nickelsburg agrees that transportation investments tend to lower costs, create markets and improve efficiency, but that is truer for freight improvements. Japan’s bullet train lowered the transportation costs for commuters, giving rise to the legendary Japanese “salaryman,” who commuted from a high-density apartment complex to a dreary city job aboard a crowded bullet train. California bullet train enthusiasts have a much different vision, foreseeing a day when the Central Valley becomes a more vibrant economic center that is better connected to the Bay Area and Southern California. Nickelsburg also raises the possibility that the train will create rather than contain urban sprawl. By increasing the potential for workers to live far from their employment, it would not create new jobs but move them to the Central Valley. Mr Nickelsburg’s conclusions would seem to tally with the experience of places like East Kent and the Mezzogiorno. Being connected to high speed passenger rail may carry relatively little weight in the totality of socio-economic regional atout. There may be (possibly unintended) consequences, with changes to a region’s perceived connectivity resulting in periurban sprawl, or redistribution of economic activity from a neighbouring region. In the British context, Mr Nickelsburg’s findings would seem to support versatile infrastructure facilitating improved freight and passenger movement, such as a reactivated Great Central line.